Guest Post at Darlene’s Book Nook! You can read my guest post about my story, ‘The Halls of War’ from ‘The End Was Not the End’ over on Darlene’s Book Nook. Thanks ever so much to Darlene for hosting my post. 😀 You can find my Guest Post beneath the ‘About the Book’ section. For those who might be interested, here’s how I saw my protagonists…! 4 Star Review of ‘The End Was Not The End’! You can read the 4-Star review by Kayla West at ‘I Read A Book Once‘. ‘The End Was Not the End’ is now out in both paperback and Kindle formats, and includes my story ‘The Halls of War’. My guest post about my story, ‘The Ultimate Sale’ in Perfect Flaw can be seen on Angela Meadon’s blog here. Well, OK, it’s a virtual blog tour, but it’s still a tour! 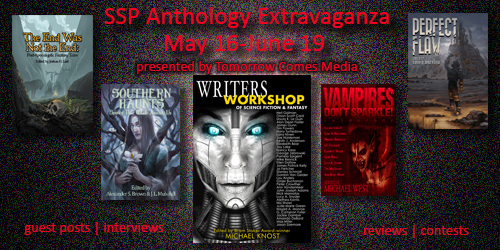 Seventh Star Press is hosting an extravaganza for 5 anthologies. You can read more here. The tour start tomorrow and continues into June, and includes five new anthologies from Seventh Star Press: Southern Haunts (paranormal), The End Was Not the End (fantasy), Vampires Don’t Sparkle (horror), Perfect Flaw (dystopian) and Writers Workshop of Science Fiction & Fantasy (writing advice/speculative fiction theme). Our little anthology has received a 5-star review here. Ill be doing a guest post on a blog tour about my contribution to this one in about a week’s time. More on that when it happens.